Mamie Smith’s 1920 recording of “Crazy Blues” was the first successful recording of a song by a blues singer. “Crazy Blues” is an important contribution to black music, but it presents some ethical problems. 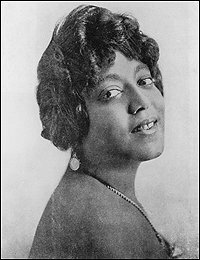 Mamie Smith’s success with “Crazy Blues” came as a surprise to record labels, but they soon realized that making records of blues songs was profitable. 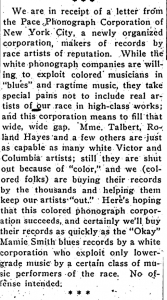 A newspaper article by a black writer from 1921 talks about the exploitation of black musicians by phonograph companies. 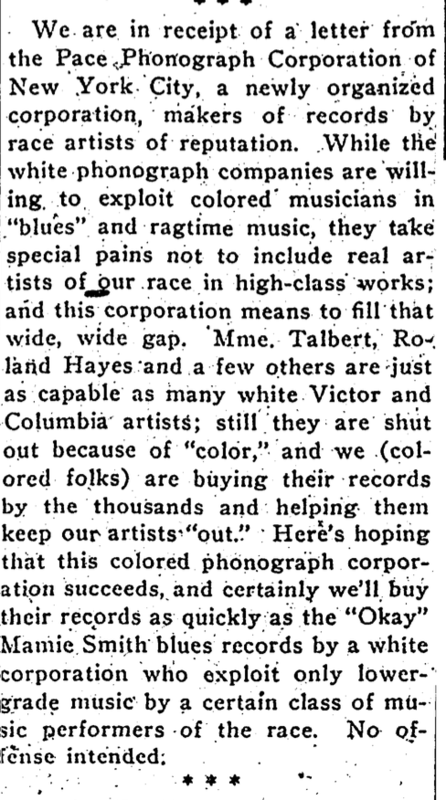 The companies used these musicians of color to sell blues music to black record buyers, but still excluded other musicians of color who performed different kinds of music. This picking and choosing of what music to produce and sell contributes to the problem of erasure in black music. There are certain kinds of music that are recorded and preserved, but others aren’t, even if they are equally important. “Crazy Blues” also brings up concerns with the development of blues. According to Elijah Wald, the discovery of race records by white people led to their reinterpretations and creation of new definitions that became very different from the original source. Karl Hagstrom Miller also acknowledges the fears of some people and their worry that the success of blues that stems from commercial record businesses covers up the Southern rural roots of blues. There were other arguments against Smith that mentioned that since she was from Cincinnati, she was not connected to the blues roots and was not a real blues singer. 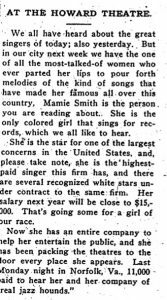 There are also complaints of Smith’s abilities as a blues singer, criticizing that she was not any better than other white singers. Yet, Smith has been a key contributor to the development of blues, specifically the blues that became established and accepted. Wald defines blues as whatever the mass of black record buyers called the blues. 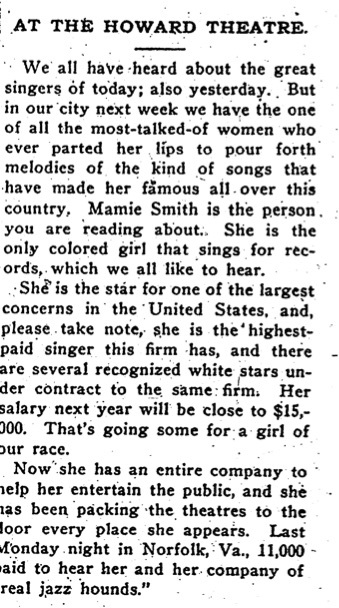 This second newspaper article from 1920 calls Mamie Smith, “the only colored girl that sings for records, which we all like to hear.” Even though Mamie Smith’s recording contributed to record companies that not only perpetuated racial inequalities, but possibly altered the advancement and preservation of blues, it doesn’t change the fact that she was popular in the black community as a blues singer and helped define the true meaning of blues. After You’ve Gone. Recorded June 18, 2014. 2014 Railroad, 2014, Streaming Audio. Accessed October 10, 2017. “At the Howard Theater.” Washington Bee. December 18, 1920. Accessed October 9, 2017. Gussow, Adam. “‘Shoot Myself a Cop’: Mamie Smith’s ‘Crazy Blues’ as Social Text.” Callaloo, 25, no. 1 (2002): 8–44. “In the World of Music.” Washington Bee. February 19, 1921. Accessed October 9, 2017. Miller, Karl Hagstrom. Segregating Sound: Inventing Folk and Pop Music in the Age of Jim Crow. Durham: Duke University Press, 2010. Wald, Elijah. Escaping the Delta: Robert Johnson and the Invention of the Blues. New York: Harper Collins, 2004. 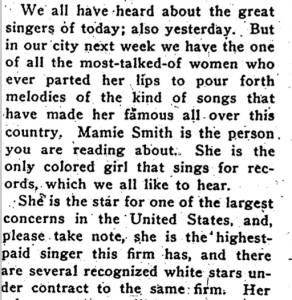 Mamie Smith wasn’t a blues singer. Today, however, we know her as one of the most influential figures in the creation of the blues music industry. So what exactly happened? Smith began as a cabaret singer, but one fateful day in 1920, Sophie Tucker, another singer, coudln’t make it into Okeh Record’s recording studio. Smith was givena chance to ake her first recording, That Thing Called Love, and after that was recruited to make an another recording of a song called Crazy Blues. Though Smith was not by trade a blues singer, she made the record anyway. After it was released, the record sold over 75 000 copies in just a few months. This success is especially notable, as this record was the first recording of a blues song by a black singer. In addition to being widely commercially successful, Crazy Blues has greater economic and social implications. This recording heralds the beginning of an entirely new music market. The popularity ofthe song caused the Okeh Records and several other labels to sign more black female blues singers to produce “race records”. Intially, these “race records” were sung by black musicians and were intended for black listeners, but soon the form of classic blues represented by these records became popular across racial lines. 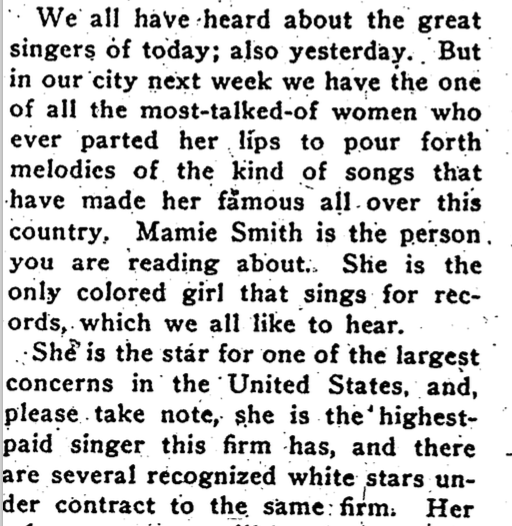 Mamie Smith’s record paved the way for countless black musicians to break into the blues market. Take five minutes and listen to noted activist Angela Davis talk about Mamie Smith’s significant contribution to the music industry in this interview with NPR’s “All Things Considered”. Further evidence of the new blues craze can be found in this article from the December 18th, 1920 issue of he Washington Bee, an African American historical newspaper based in Washington D.C.. Situated neatly on the front page, this small notice of an upcoming performance at the Howard Theater exemplifies the excitement stirring around the new musical possibilities illuminated by Smith and her record. The author of the article heralds Smith as “one of the most-talked-of women who ever parter her lips to pour forth melodies…”. Not only does this article encapsulate Smith’s increasing fanbase, but also the uniqueness of her position in society. 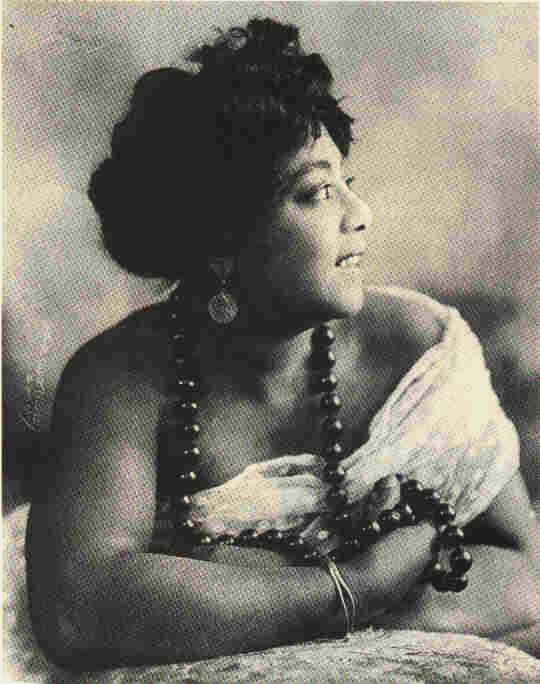 Smith, as a woman of color, was the highest paid among Okeh Records singers. This newfound ability to turn blues into money and record sales was profitable not only for musicians, but also for record companies and theaters. Companies began to find out that if they could contract a blues singer they could make a quick buck . This recording, and the subsequent boom in “race records” ushered in a entirely new and relatively untapped musical market. Before this record, music wasn’t being marketed toward black audiences. Rather, black folk music was idealized to fit white musical standards. While this recording and these newspaper articles may still reflect the capitalist pandering that musicians are so often wont to do, they also reflect a change in the way the msuci industry looked at its consumers. Mamie Smith and her record Crazy Blues opened up an entirely new market to the music industry while simultaneously creating a pop-culture phenomenon. And I think that’s worth noting. “At the Howard Theater.” Washington Bee (Washington D.C.), December 18, 1920. Accessed October 10, 2017. African American Historical Newspapers,. Oliver, Paul. “Smith, Mamie.” Grove Music Online. Oxford Music Online. Oxford University Press, accessed October 10, 2017, http://www.oxfordmusiconline.com/subscriber/article/grove/music/41390. “Mamie Smith and the Birth of the Blues Market.” NPR. November 11, 2006. Accessed October 10, 2017. http://www.npr.org/2006/11/11/6473116/mamie-smith-and-the-birth-of-the-blues-market. Sultry Divas. Recorded September 30, 2008. Columbia River Entertainment, 2008, Streaming Audio. Accessed October 10, 2017. http://search.alexanderstreet.com/view/work/be%7Crecorded_cd%7Cli_upc_723723519221.